Cut N Clear Ltd the proud owners of a Vahva Jussi and Botex trailer and crane combination. The trailers give better mobility when working between narrow rows of trees. These trailers have a very clever 4WD system which goes almost anywhere even in wet conditions without causing soil compaction. 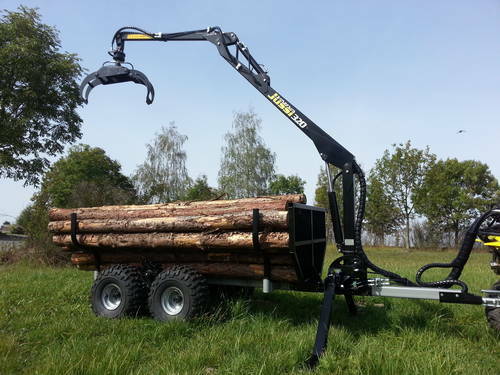 The Vahva Jussi and Botex trailers are very low impact on environmentally sensitive sites and brilliant in inaccessible woodland and forest. One man could now transport around 1.25t of ash thinnings from the woods, stack them and, depending on distance, remove over 40t a day and all of this without causing any damage to the standing trees or the forest floor. If extracting conifers to roadside the output would be substantially higher. To see and fully appreciate the Vahva Jussi in action please click the link. When you are ready to go ahead with a demonstration or to enquire about day rate for the trailer and operator call Christine Stewart on 01476 591378 or email Chrstine@cutnclear.com to arrange an appointment or use our contact form available here.